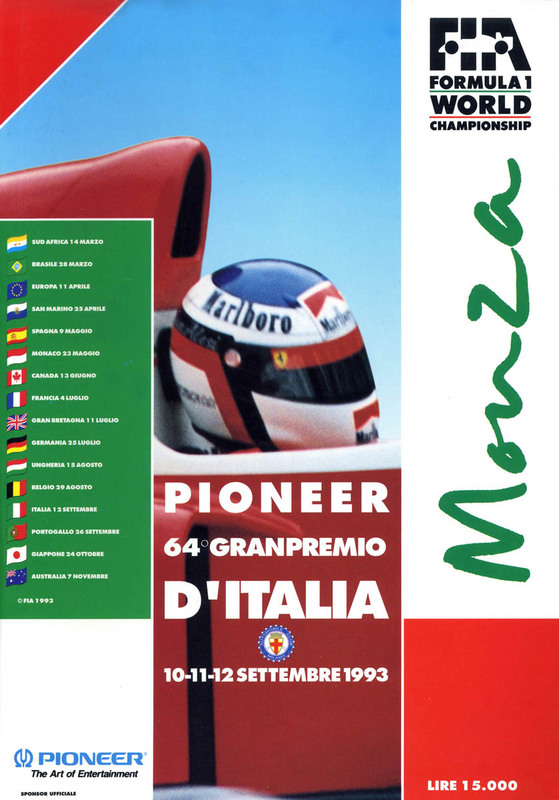 The 1993 Italian Grand Prix (formally the Pioneer 64° Gran Premio d'Italia) was a Formula One motor race held at Monza on 12 September 1993. It was the thirteenth race of the 1993 FIA Formula One World Championship. The 53-lap race was won by British driver Damon Hill, driving a Williams-Renault, after he started from second position. Frenchman Jean Alesi finished second in a Ferrari, while American Michael Andretti finished third in a McLaren-Ford, in his final F1 race before returning to IndyCar. Hill's teammate, Frenchman Alain Prost, took pole position and led until suffering an engine failure with five laps to go, allowing Hill to take his third consecutive victory. The Williams cars once again dominated qualifying, locking out the front row of the grid with Alain Prost on pole and Damon Hill alongside him. Jean Alesi took third in his Ferrari, much to the joy of the Tifosi; he was joined on the second row by Ayrton Senna in the McLaren. Michael Schumacher in the Benetton and Gerhard Berger in the second Ferrari made up the third row. Further down the grid, there were two new faces: Pedro Lamy was making his Grand Prix debut for the cash-strapped Lotus outfit, taking the place of the injured Alessandro Zanardi, while the Jordan team, needing a replacement for Thierry Boutsen following the Belgian's retirement from F1, had decided to evaluate promising young Japanese Formula 3000 driver Marco Apicella, after their test driver Emanuele Naspetti had turned down the opportunity to race. At the start, Alesi got ahead of a sluggish Hill and Senna tried to do the same, but there was contact between Hill and Senna, resulting in both drivers dropping back, with Senna ending up in 9th and Hill right behind him in 10th. Further back there was chaos, as two separate incidents saw five cars eliminated at the first chicane. In the first incident, the Footworks of Derek Warwick and Aguri Suzuki collided and took each other out. In the second incident, Sauber driver JJ Lehto, who had to start from the back of the grid, was hoping to recover lost ground and proceeded to take himself and the Jordans of Rubens Barrichello and Apicella out of the race. Apicella's debut, which would also turn out to be his only Grand Prix start, had lasted no more than 800 metres, unofficially making him the driver with one of the shortest careers in Formula One. Prost led Alesi, Schumacher, Berger, Johnny Herbert and Martin Brundle into lap 2. On lap 4 Schumacher passed Alesi to take second position. At this point, Prost led by nearly 20 seconds, but by lap 48 Hill had reduced this lead to two seconds. Then, on lap 49, five from the end, the Renault engine in Prost's car let go. Hill duly took his third consecutive win by 40 seconds from Alesi, with Michael Andretti third and Karl Wendlinger, Riccardo Patrese (scoring his final points in F1) and Érik Comas completing the top six. The finish of the race also provided Formula One with one of its most spectacular moments. The Minardis of Pierluigi Martini and Christian Fittipaldi had approached the chequered flag line astern when Fittipaldi's left front wheel made contact with his teammate's right rear wheel. The contact launched Fittipaldi's car into the air where it did a near perfect back flip before landing back on its wheels and skidded across the line. Neither driver was hurt and both finished the race without losing a position. This was the Williams team's seventh consecutive victory. Prior to the race weekend, Andretti was informed by McLaren that this would be his final race with the team due to poor performances,[citation needed] and he would be replaced by the team's test driver, Mika Häkkinen. Ironically, his final Formula One race would also turn out to be his best result with his third-place finish. ^ "Motor Racing Programme Covers: 1993". The Programme Covers Project. Retrieved 12 November 2017. ^ "1993 Italian Grand Prix". formula1.com. Archived from the original on 2 December 2014. Retrieved 23 December 2015. ^ a b "Italy 1993 - Championship • STATS F1". www.statsf1.com. Retrieved 18 March 2019.